Rah Cha Chow: Banana Loaf Cake - with TONS of bananas! Banana Loaf Cake - with TONS of bananas! Like every other city, it seems, Starbucks is all over the Rochester area. We're even getting a new one walking distance from my home. While I like the atmosphere of Starbucks, their coffee is too bitter for me, and the lattes vary widely in terms of flavor. Some of their baked goods are tasty, though. One of my favorites is their reduced-fat banana cake. 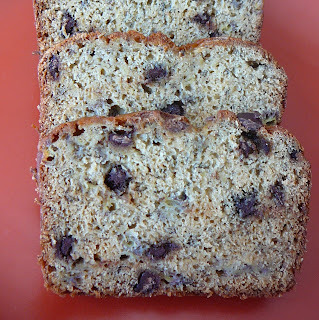 It is not as dense as most banana breads, but is super moist and has a pronounced taste of banana (which I'm starting to suspect has banana flavoring rather than lots of real bananas). Anyhoo ... I've made this recipe twice and it turned out moist and delicious both times -- although still more "banana bread" than the Starbuck's cake. (Of course I did use some white whole wheat flour, which may have made it a little more dense.) This is now my go-to recipe when I have lots of overripe bananas. I prefer making sweet breads in mini loaves so that I can share them, but it bugs me that it's hard to find baking directions for small loaves, so I've included those. The first time I made this was one larger loaf and one smaller, and the second time I did four small ones. Oh, and being the compulsive competitive cook that I am, I couldn't resist entering this in the Banana Bread Bake-off Event hosted by Not Quite Nigella! Check in mid-May to see all of the great entries! Spray pan(s) with Baker's Joy, or cooking spray and a dusting of flour. Set a rack in the middle level of the oven and preheat to 350 degrees. Stir together the flour(s), baking powder, baking soda, and cinnamon. In a medium mixing bowl, whisk the egg whites to break them up, then whisk in the sugar and the brown sugar. Whisk in the butter and vanilla, followed by the mashed bananas. Sift the flour mixture over the banana mixture and thoroughly fold it in. (Add the chocolate chips, if using.) Scrape the batter into the prepared pan and smooth the top. Cool the cake in the pan on a rack for 10 minutes, then unmold it and cool completely on a rack. Storage: Keep the cake wrapped in plastic at room temperature after it has cooled. For longer storage, double wrap and freeze for up to a month. Weight Watchers information: The Starbucks reduced-fat banana loaf cake with chocolate c hips has 8 points per serving. This recipe, if you cut the loaf/loaves into 12 pieces, has 6 points per serving if you use all whole wheat flour (instead of half and half) and the egg and egg white as directed. The banana bread looks great. I have been thinking I need to do something with my ripe frozen bananas that are in my freezer and this is perfect. Thanks! I'm not a coffee drinker, so it's rare to find me in Starbucks. I have never had any of their baked goods, but I did make one of their recipes once, and it was amazing. This banana bread sounds wonderful! I am getting ready to make my banana bread in the morning for that same BBbake-off. Who could resist?!! Your bread looks great! I was looking forward to Top Chef tonight then realized it's Tues, I need to go to bed! This banana cake looks very yummmmmy. I think Deb is talking about the chocolate spice "bread" that she and I made a while back. Lisa, try it and let me know what you think of it! I thought 2 1/2 cups of banana seemed crazy but it worked. Deborah, not going to Starbucks is a good thing -- for your waistline and for your wallet! Jenny - looking forward to checking out your entry! I actually have another recipe (and three black bananas) waiting in the wings. I may have to enter that contest more than once. Emiline, your personality seems far from bitter! I'll be sure to check out that chocolate spice bread on your blog. Great to find another successful light banana bread recipe. I always have some dead bananas in my fruit basket ready to use up! The banana bread looks delicious...I love Starbucks cream cheese filled carrot muffins...mmmm! I made this recipe this morning and changed a few things (due to what ingredients I had in hand). I also made it in a round springform pan so it looks like a cake rather than a loaf. It turned out great. A nice lowfat dessert. THANKS! Do you mind if I post on my blog? I think I will have to get another recipe to try the BB bakeoff. I still have more bananas in my freezer. Veronica, I may have to try those muffins! Lisa, of course feel free to put it on your blog (maybe I should have checked with David but he seems busy). Sounds like you made enough changes that it's your own -- feel free to enter it in the banana bread cookoff! Not that you needed my permission for either. I've been looking for a lower fat "go to" banana bread recipe for ages. I like the idea of adding chocolate chis for a little extra something. This is the oven as I type :)) Cant wait to taste :)) Sounds wonderful! In the oven as I type! Is this cookie REALLY worth a million dollars? Rochester represented well at Pillsbury! Luggage arrived and the cooking is over! Lovely dinner, more "semi" than "formal"
I'm in Dallas ... but my luggage isn't. Almost time for my date with the Doughboy!